On Sunday 30th January 2011 we had another pup arrive from Guernsey which was rescued by the GSPCA, this pup is a little girl and around 8 weeks old and rescued due to malnourishment. 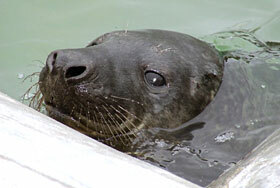 She has arrived at the sanctuary to continue her rehabilitation before being released back to the wild. She has been named Smithy and is currently in the pup rehabilitation pool by herself but will hopefully have some new friends once she has settled in. Update: 4th March 2011 - Smithy's flipper tag number 36 (white). She is doing well. Update: 30th May 2011 - Smithy along with Dory and Wall-E were released back into the wild at Church Cove on 12th May 2011.
or make a donation towards a pup´s rehabilitation, please click here.